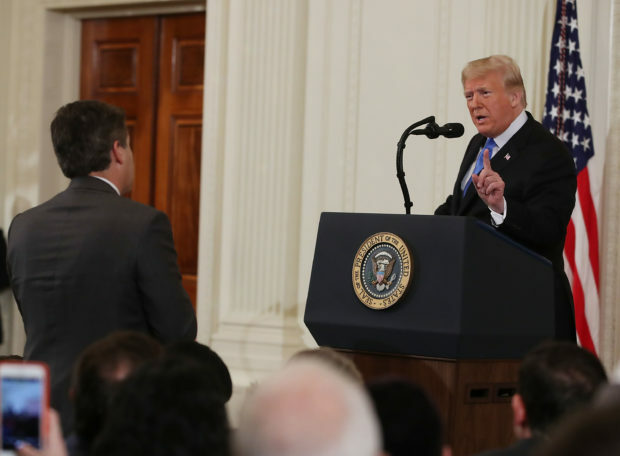 President Donald Trump addressed the revocation of CNN’s Jim Acosta’s press pass on Friday, asserting that reporters have to treat the White House and the presidency with respect. The White House revoked Acosta’s press pass on Wednesday night after he debated the president during a press conference and refused to surrender his microphone to an intern, blocking the young woman with his arm. White House press secretary Sarah Sanders accused Acosta of “placing his hands” on the intern, calling his conduct “unacceptable.” Acosta denies that he acted inappropriately.